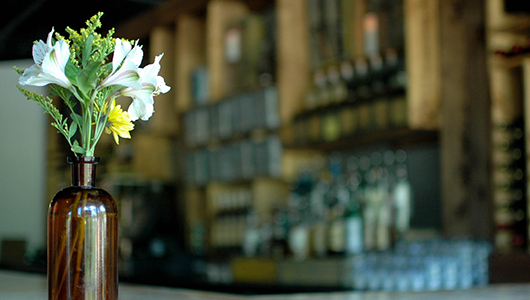 In the competitive world of modern dining, providing great food with stellar service is a baseline requirement. But restaurants that make it, and ultimately thrive, provide more than just a place to order and eat a meal. Arbitrary, personal and the highly subjective intangibles of atmosphere, design and mood can elevate a basic repast into a must-repeat experience for patrons, whether it’s at the neighborhood bar or a five-star fine dining extravaganza. 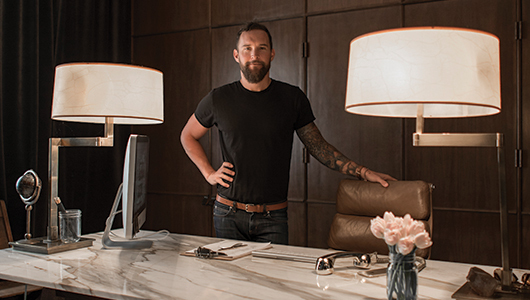 Utah design guru and real-estate agent Cody Derrick, owner of cityhomeCOLLECTIVE, thinks that those personal touches and gracious elements are what keep people coming back. “It’s the small moments that create big impacts,” he says. 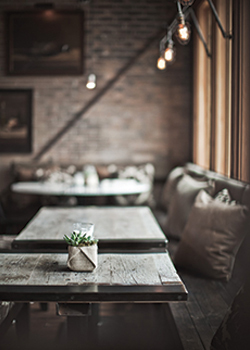 Consider the luxurious, haunting and distinctively moody vibe created in spaces he’s designed, such as Pallet Bistro and Finca. Derrick also believes that those memorable details are what big corporate design teams often overlook. Fortunately for the denizens of the Beehive State, we’ve got handfuls of restaurants brimming with delicious design. Some of our favorite spots are highlighted on the following pages. Not only have chefs and owners invested more than just their cash into their projects, they have brought personal elements, innovation, creativity and even some sweat equity to their spaces. “Doin’ it yourself” never looked so delectable. When Handle co-owner Melissa Gray couldn’t find the perfect wallpaper for the restaurant, she made it herself. She found vintage books and painstakingly fit their pages onto the restaurant’s walls, like a massive decoupage project. That’s just one example of how hands-on Gray and her husband, chef Briar Handley, were when they tackled the renovation of their space in Park City. Handley took on the task of demolition with zeal: moving walls, removing four layers of flooring to expose the original cement surface and completely reconfiguring the kitchen to his exacting specifications. 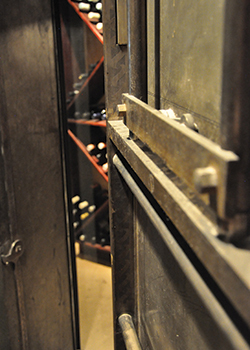 miners’ lockers for the bar’s wine storage. They’ve incorporated architectural and accessory elements that specifically call to a sense of history and place in this old-mining-town-gone-glitzy ski mecca. 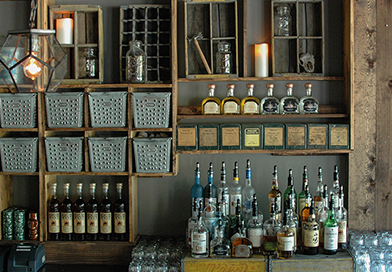 Even a trip to the restroom is an adventure in good design at Pallet Bistro. It’s part of restaurant designer Cody Derrick’s philosophy that “nothing should jar you out of the experience” of place, which integrates seamlessly from the dining room to the restrooms. “The music, the lighting, the mood. It should all carry through,” says Derrick, who envisioned the restaurant as a place where people would feel as comfortable dining alone as they would when celebrating in a big group. Co-owners Rocky Derrick (Cody’s brother) and Drew Eastman helped with last-minute construction details before opening, and the moody oil paintings commissioned by artist Courtney Derrick (Rocky’s wife) include Utah landscapes and historical figures like Porter Rockwell and Courtney’s grandparents. From the clerestory windows above the dining room to the original roll-down doors accessing the kitchen, the space resonates with history. In the early 1900s when the building housed the city’s first dairy and creamery, this was a blue-collar part of town. Pallet has a proletarian vibe that carries through this decidedly urban upscale space, where gals in business suits sit elbow-to-elbow with guys in ripped denim. Derrick’s concept integrates fabrics, color, art and architectural elements of reclaimed wood and metal, making this hot spot simultaneously hoi polloi and haute. If you haven’t been to Martine since its recent renovation, you are in for a visual and culinary treat. Owner Scott Hale and chef/owner Tom Grant closed the restaurant for seven weeks to complete a massive renovation of the historic space, with most of the construction done by their own hands. They removed drywall from the entire east wall of the dining room, exposing pale red bricks soaring two stories up to meet the original pressed metal ceiling. Hexagonal tile flooring next to the re-organized kitchen space completes the vintage feel. Hale and Grant rebuilt the banquets and seating, and only outsourced the re-upholstery and the custom cabinetry. Hale has a long history of hands-on design of the spaces he owns, saying, “You can do the work yourself for a fraction of the cost” of hiring out the design concepts and construction. He recommends the tremendous business advantage of financing projects out-of-pocket rather than obtaining construction loans. Hale says design is one of his favorite parts of owning restaurants, and he’s very proud of what they have pulled off at Martine. They should be proud. It’s pretty delightful. In 1992, Market Street’s co-owner, John Williams, visited La Coupole restaurant in Paris. Inspired by murals on the dining room’s columns painted by art deco masters—who had legendarily painted in trade for food and drink at La Coupole—he envisioned a similar aesthetic exchange at the Market Street Oyster Bar. Williams, along with co-owner of Gastronomy Inc. restaurant group Tom Guinney, had established a legacy of preservation and adaptive re-use of historic buildings since they renovated the landmark New York Hotel (1906) for The New Yorker restaurant in 1978. 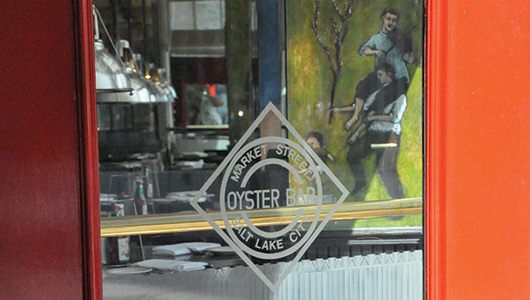 By incorporating murals by Utah artists in the Market Street Oyster Bar’s design, Williams anticipated a win-win, supporting and promoting local artists while at the same time giving the historic space a modern and unique pop. Gastronomy Inc. public-relations consultant John Becker remembers the time fondly, when famous Utah artists such as Lee Deffebach, Randy Royter, and Don Weller were working at the space. “They could paint whatever they wanted on the columns,” and in return received Gastronomy Inc. gift certificates. The 13 original works are all visible at the Oyster Bar, along with additions such as a mural painted to commemorate the 2002 Winter Olympics. 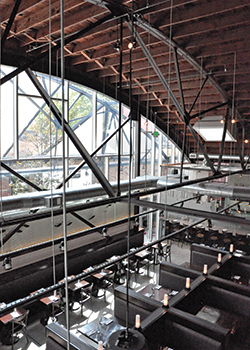 It’s a legacy of art, community and historic preservation, all in one dynamic space. One of Salt Lake City’s most stunning restaurant debuts this year was the much-anticipated opening of Current Fish & Oyster. The “elegant grunge” feel created by Luna Design Studio has a decidedly hip and modern vibe. But the exposed steel girders, original high barrel ceiling and huge wood beams of the historic 1906 Ford auto dealership are visible, revealing the gorgeous bones of this beauty of a building. Luna Design Studio architect Louis Ulrich says of their concept, “We love to create a memory and find a way within our design to create that for diners.” While the million-dollar project stretches the limits of what most restaurateurs could realistically handle as a DIY project, this meticulously restored space has quickly become a community favorite for design that is as tasty as the food coming out of the bustling open kitchen.